I love making candles. To be more precise I love beautiful candles and I love candlelight, but I am also fascinated by the process by which they are made and believe that hand-made candles have something more magical about them than mass-produced ones - even if they are just that little bit wonky. Back when I was in my early teens I got a book out of the library about candle-making, which led me to try making my own and I really got into it as a hobby. I bought moulds, wax, wicks, dyes and scents and for a few years pretty much everyone I knew got given candles I had made for birthdays and Christmas. But time went on and I got so busy studying for exams that my candle-making stuff gathered dust and eventually got given away when I went off to university. Nevertheless, it was always a hobby I wanted to take up again some time, so when I saw an offer a month or so ago for a candle-making workshop, I signed up. "On the half day workshop you will make and take home 4 candles that you will have made and personally decorated! You will study how to use a quantity of different waxes and scents to create spectacular candles and then when you thought it was all over we will teach you 3 gorgeous way to beautify either the exterior of your candles or the containers in which you make the candles." The special offer was great too – a whopping 76 per cent off the normal cost of the workshop. I signed up straight away and was only disappointed that the classes were so fully booked that I had to wait until the start of May for an available session. I did have one reservation though, and that was whether the course would be too basic. Naz, the lovely woman who runs Midas’s candle-making classes, pointed out to me over email that the classes are really aimed at beginners and she was worried I would be bored. As it turned out, she was completely wrong. 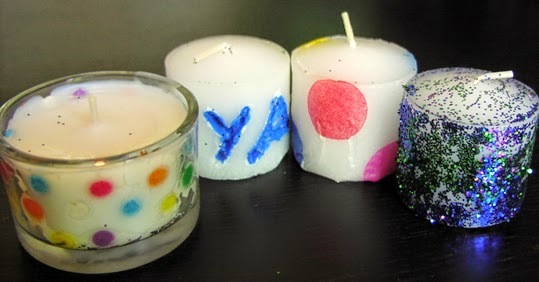 Okay, the first few things on the syllabus – a short talk on the history of candles and lesson on how to make a small candle in a glass pot - weren’t exactly new to me, but Naz’s teaching style was so full of enthusiasm for her subject that I wasn’t in the slightest bit bored. While our little tea-lights set, the class learnt three decorating techniques; glitter, carving and painting, and applying tissue to the outside of the candle using a hairdryer to bond the paper to the wax. For the painting, I learnt to use some rather wonderful liquid wax pens that weren’t around back when I was a teenager (pictured right). They are pretty cheap to buy too. You can see the finished results of my four candles (no Two Ronnies jokes please) in the picture at the top. Yes, I know they aren’t particularly artistic, but practise makes perfect and I fully intend to practise.